Turkish coffee requires the finest grind of all the home brewing methods. This means that if you want to grind your own beans to make Turkish coffee, you will need a grinder capable of producing a sand-like consistency, one that’s even finer than espresso grind. After making an entry in our 2Caff top coffee brewing methods piece, I thought it would be great to get more technical on the top Turkish coffee mill options. To help you choose a suitable product, we’ve selected 5 of the best coffee grinder for Turkish coffee. 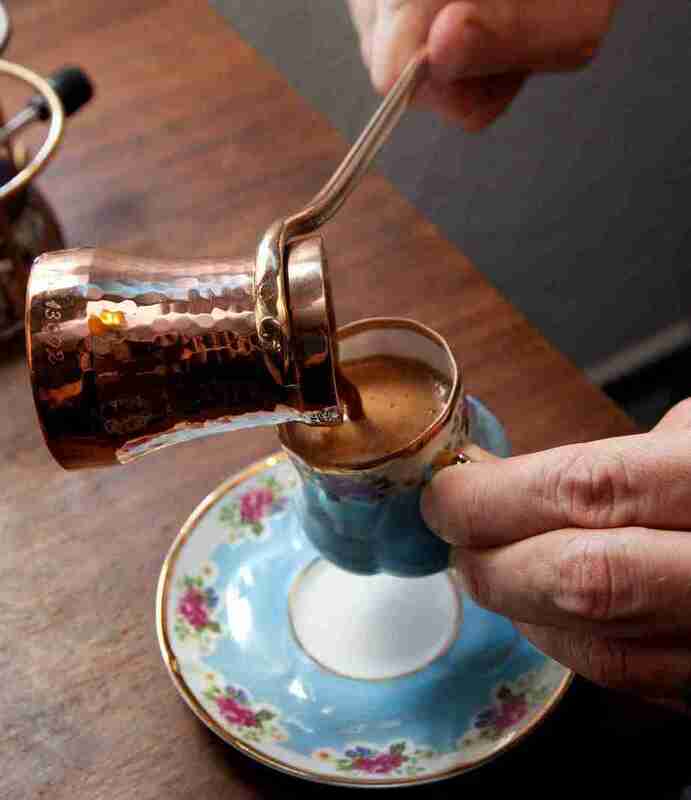 We’ve also put together a short guide to making Turkish coffee at home. Get ready to learn the tips for the best aromas and taste for your coffee preparation. FAQ some coffee drinkers have. What does Turkish Coffee taste like? Why is Turkish coffee so strong? Our first choice is the only electric grinder on the list. This is mainly because to get the best Turkish coffee grind, a manual grinder is best. The other reason is that it can be hard to find a US grinder that can achieve a fine enough grind for this brew method. However, the Cuisinart is a decent all-around grinder that can the job done. As you can see from the table above, this a disk/blade burr grinder, rather than the more common (and more expensive) conical burr system. Within each grind ‘type’ – fine, medium, and coarse – there are 6 separate settings. For Turkish coffee, you should select the smallest setting on the ‘fine’ side of the grinder. The Cuisinart also allows you to select the number of cups you want to grind for (from 4 to 18) It’s worth setting this a little higher than required when grinding for Turkish coffee to compensate for the coffee dust. 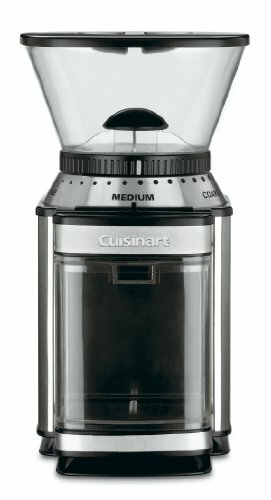 Verdict: In the world of Turkish coffee, manual grinders might be king – but if you need or want an electric-powered option, the Cuisinart is a respectable choice that you can also use to grind for all the other home brewing methods. Our second choice is a multi-purpose manual grinder that was supposedly designed for the Greek army to grind coffee in the field. While it’s by no means perfect, this grinder certainly looks the part. It’s a handsome, durable, gold-colored grinder that can grind down to a power-like consistency. However, this isn’t the easiest grinder to adjust and third-party reviews are polarized (with over half rating it 5-star). Adjustments to grind size are made by moving the internal grinding teeth up and down (further up, the finer the grind). In addition to coffee beans, this grinder can be used for pepper and spices. Note that while the manufacturer also makes an 8-inch version of the grinder, this model is not suitable for coffee as the opening is too small for the beans. Verdict: This is a beautiful-looking Greek-made grinder that works well for Turkish coffee – as long as you’re willing to put in the time and effort. 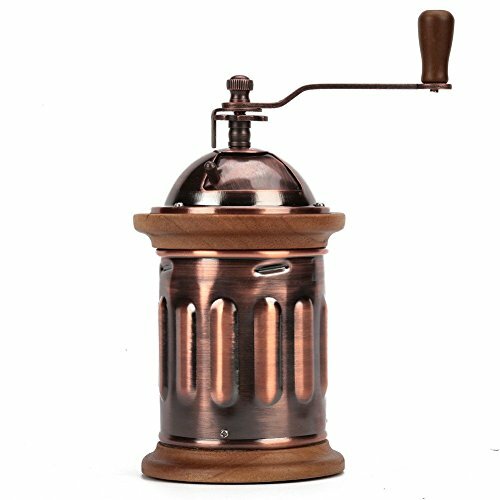 If you like this design, you might also like Myturkishmall’s Handmade Traditional Brass Turkish 11-inch Coffee Spice Grinder Mill. Our third choice is a traditional-style manual grinder, featuring a brushed stainless steel cylindrical body and adjustable durable ceramic burr grinders. This grinder is easy to use and adjust. Simply fill the top chamber with coffee beans, turn the hand crank, and the fine ground coffee collects in the lower chamber. Adjustments to grind size are made using the dial at the base of the top chamber. For Turkish coffee, the dial should be turned until tight. This makes grinding a little harder, but the consistent results are worth the extra effort. The operation is impressively quiet and smooth. 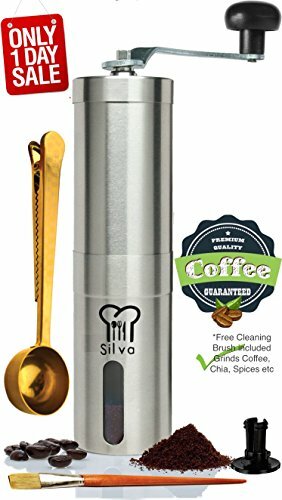 It is sold with a fine coffee scoop and cleaning brush, making it easy to clean. Verdict: This is an all-around great manual grinder that offers consistency of grind for Turkish coffee and ease of use – it’s small size makes it especially good for grinding ‘on the go’. Our next choice is a compact, mill-style conical burr manual grinder. This is an ideal grinder for times when you only want to grind a small amount of freshly ground coffee. While it is fully adjustable using a simple tightening dial, this grinder works particularly well at the fine end of the scale, making it a good choice for Turkish coffee (as well as espresso and other brewing methods that require a fine grind). Instead of a slim, cylindrical design, this grinder features a wider bean hopper and the durable glass bowl to collect the grounds, with a hand crank to grind the coffee. While grinding coffee beans takes some effort with this grinder, the results are worthwhile. This grinder can also be used to grind pepper and spices. Verdict: This is a quality, compact manual mill grinder that produces a consistent fine grind suitable for brewing fine Turkish coffee at home. Our final choice is a stainless-steel burr canister grinder. It features a handsome antique copper body with a stainless steel top and distinctive ‘fire hydrant’ shape that makes it easier to grip than some other designs. The operation is similar to the other manual grinders on the list, with a top chamber for the whole beans, a hand crank, and a lower chamber to collect the grounds. There are a few differences, however, including the grind adjustment, which is done by turning the gear directly under the handle. The grinder features quiet, smooth operation and a consistent grind, fine enough for Turkish coffee. It can also be used for grinding spices. Verdict: This is a quality grinder that offers a stylish way to grind for brewing some fine Turkish coffee at home. The first thing to note is that Turkish coffee is not for the fainthearted! This type of brew is strong and robust. If you would like to try brewing this style of coffee at home, we’ve put together a quick guide. Read here to see the coffee preparation. Other versions of Turkish coffee include crushed spices, such as cardamom seeds, nutmeg or cloves, for some great aroma and taste. Now comes the difficult bit as there are different views on the best brewing method. Some recommend heating the water before adding the coffee (and sugar), while others recommend introducing the freshly ground coffee (and sugar) to the water before heating. Likewise, some recommend boiling the coffee, while others warn against letting the brew boil. The important thing is to refrain from stirring the coffee until the water has warmed up enough so the coffee (and sugar) dissolves, in order to prevent clumping. The overall aim of this brewing method is for the coffee to form a thick froth on top of the water. For this, it is best kept below boiling point, at around the 158F/70C point. Once the froth starts to form, you scrape it off and put it into the cups. Continue to heat the coffee and remove the froth, taking the pot off the heat if there’s a danger of the brew boiling or bubbling over. The idea is to continue the foaming stage until the coffee starts to boil over (you can bring it close to the boil and let it cool a couple of times). Finally, remove the pot from the heat and pour out the contents into the cups (grounds and all), making sure there is foam on each. To drink, leave the brewed coffee to stand for a minute to let the grounds sink to the bottom. Traditionally, Turkish coffee is served with a glass of water on the side. Milk is not added. For more information on making Turkish coffee, check out this resource. The taste of the Turkish coffee is characteristic for his intensity. But most importantly, when talking about Turkish coffee it refers to the coffee preparation method. Turkish coffee is freshly ground so it dissolves in water and ingested. You basically ingest the coffee beans. For the coarse grind, you can use an electric burr, smart grinder, or other grinding mechanisms you have on hand. You can be surprised by the strong taste and aroma of Turkish coffee, especially if it has all those amazing spices. Well, as is not drip coffee, Turkish coffee undergoes a much more complicated grinding process than other coffees since it must be finely ground into a powder. Like the coffee itself, remains in the beverage, it contributes to the coffee body, aroma, and intense taste. When you hear the phrase “Turkish coffee”, it might not always mean the same thing to different people. The style originated in the region of modern-day Yemen, popularized during the Ottoman Empire beginning in the 16th Century. As a style, it’s more Arabic than Turkish per se. Because many former territories of the former Ottoman Empire do not exactly have a “warm” associated with Turkish (read: Ottoman) culture, you may frequently find different nomenclature. For example, in Bosnia it’s referred to as “Bosanska Kafa” and in Cyprus its called Kypriakos Kafes. Similarly, Greeks now refer to it as Elliniko since about the 1970s (for some interesting geo-political reasons). 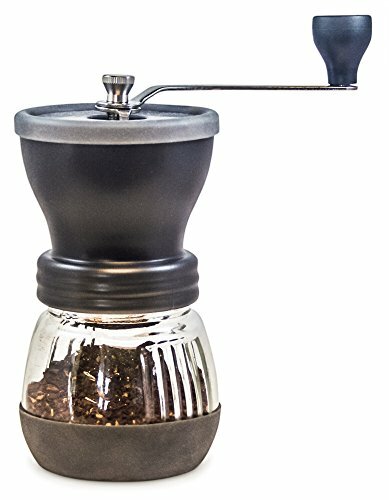 While this article focuses on the best grinders for Turkish coffee, to enjoy a really authentic experience you can go the whole way and invest in a full set, such as this one from Bosphorus that includes a coffee maker, fincan, and a grinder mill getting a great taste and aroma for your Turkish coffee.